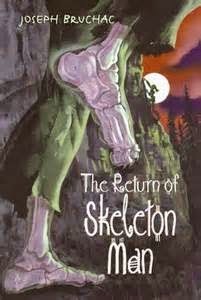 The Return of Skeleton Man, by Joseph Bruchac (HarperCollins, 2006), sequel to Skeleton Man (my review). Two rather cool things save her. One is her ability to operate heavy machinery, a pleasing thing to see in an adolescent girl character! The other is an unexpected ally--a Mayan woman with her own powerful connection to the strengths of the spirit world. An additional reason to add this one to your shelves is that, like its predecessor, it's a pretty unique middle grade fantasy/horror book in that it features a contemporary family who is Native--it is who they are, in a matter-of fact way. These two sound interesting - I do like a scary story.